ST. GEORGE — Ogden Police and The Church of Jesus Christ of Latter-day Saints are asking for the public’s help in locating a Mormon missionary who reportedly went missing Monday in Ogden. Sister Heeji Nada Kang, 20, from The Woodlands, Texas, went missing while serving as a full-time missionary in the Utah Ogden Mission, LDS Church spokesman Eric Hawkins said in a media statement. 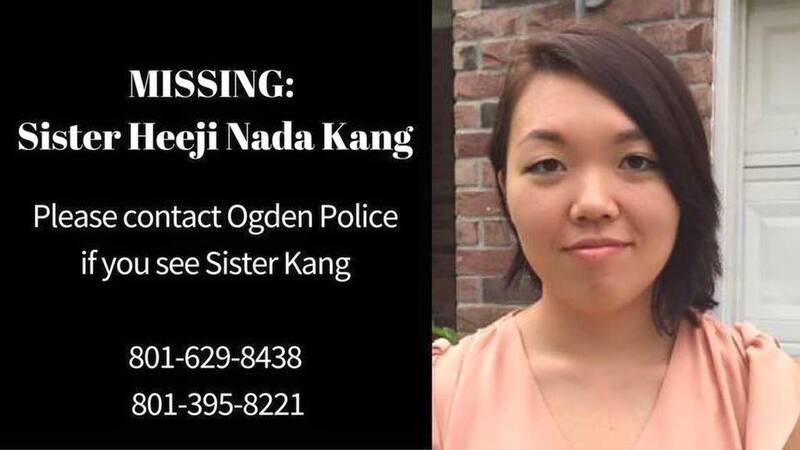 Kang was last seen on Monday evening when she left on foot from her apartment in Ogden, according to the statement. Anyone with information on Kang’s whereabouts is asked to call the Ogden Police Department at 801-395-8221. She must have wised up and went rum running. Great Success! Lots of flooding currently in Woodlands TX where she is from. Historic rains and rivers flooding many homes and ranches. Maybe she went home to help family or ? ?